One episode showed how they made latex surgical gloves. These ceramic hand-molds are dipped in a latex solution on a long assembly line. The solution dries on the ceramic hands and the gloves are then blown off with a jet of air. The scene of hundreds of hands moving along the manufacturing process was odd and hypnotic. I think those things in the window, in front of the painting, are ceramic latex glove-molds. 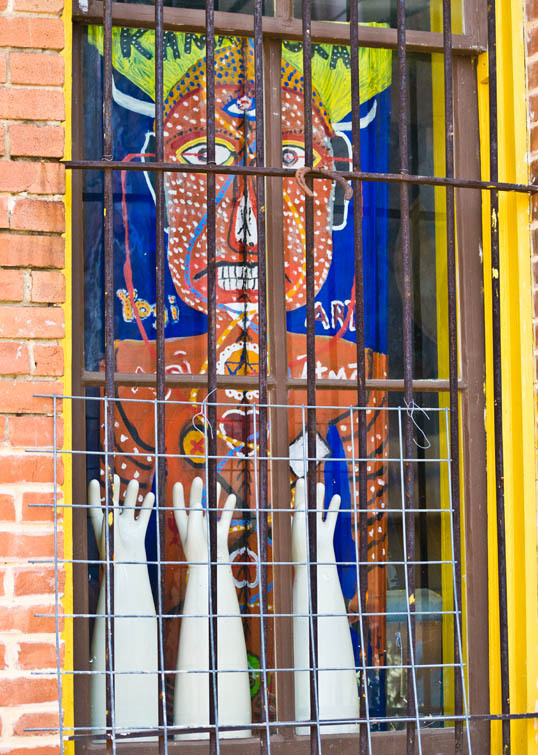 This entry was posted in Photography and tagged Art, glove, latex, mold, painting, photowalk, Texas, waxahachie. Bookmark the permalink. The painting in the window is really cool.